Several years ago, I saw pictures of a book that a friend made for her Mom’s birthday. It was a book of photos of every plant in her mother’s garden. The pictures were beautiful, lots of plants with colorful and showy flowers. But what amazed me the most was that she named each and every plant! She knew their common and scientific names! I thought that was just one of the most amazing things to know the names of so many different plants. So now I’m borrowing the idea from my friend. I am going to photograph and name as many of the plants in the farm as I can. It turns out that learning to identify plants is very similar to learning how to identify birds. When I first started birdwatching I didn’t know the names of our local birds. I am a city person and knew the name of one bird, the maya. What I did was to list the top five birds I was most likely to see in my neighborhood and memorize their names and what they looked like. I found that once I learned those five birds, it became easier to learn the rest. My brain got trained to recognize bird features. The same thing happened with plants! When I first visited the farm, the clusters of trees looked like a dense and confusing mess. I was daunted by the prospect of learning how to tell one tree from the other. 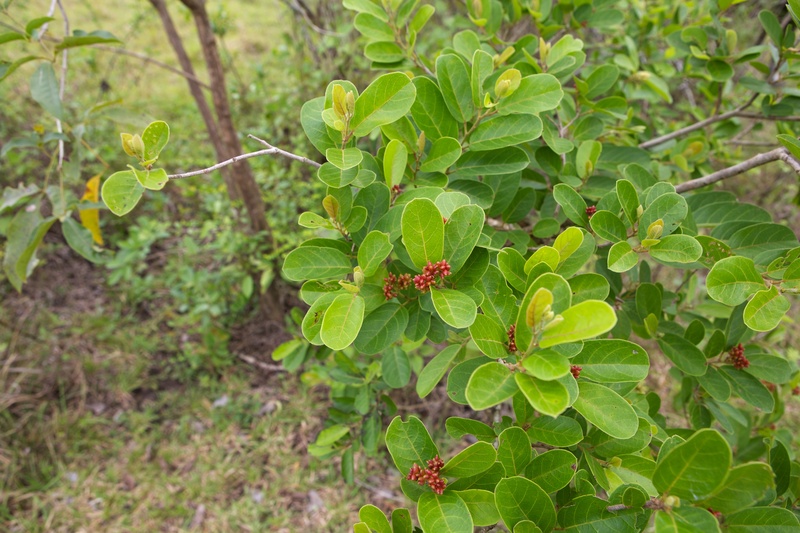 On one of our first visits, the husband asked me to take a photo of a small tree with red flowers on the road going to our property. He liked the the way it looked and said that he noticed that there was a bigger one inside our property. So I took a photo and asked our farm hand what it was called. When I got home, I looked it up on the internet. I learned that it was Antidesma ghaesembilla, commonly known as kabugbug. It is also known as binayuyu. It is suitable for a lot of things including erosion control, living fence, riparian management, reforestation of dry or arid areas. Its fruits are edible and made into wine and preserves. The shoots are edible and the leaves have medicinal uses. Lo and behold, the next time I went to the farm I saw the kabugbug everywhere! We had been standing beside a very tall one that was right by our entrance! Then, I noticed that most of the medium sized trees are madre de cacao and most of the small saplings that were growing in the middle of the grass were guava. And there I was planning to buy madre de cacao and guava! It may turn out that there aren’t a great variety of trees in the farm. Maybe there are just a lot of the same five or so trees and this plant catalog project will be finished sooner than I thought! Next Next post: Is Farming as Fattening as Birdwatching?